"Those who don't follow the rules are scum. But those who abandon their friends are worse than scum"
"For those who follow the path of revenge, it never ends well. Even if you get your revenge what will you have left? Emptyness." "I will not allow my teammates to die"
"Those who LIVE by the blade, DIE by the blade"
I rarely use my Zanpatou (Soul Slayer) in this form. I use my ninjutsu, taijutsu, genjutsu, and weapon skills to defeat my oponents. I was born with the element of lightning but i have learned water, wind, earth and fire later on. I can equip 3 to myself once and i can use any jutsu in that element. If I had water, wind, and lightning equiped, i can't use a fire jutsu. And i can't change the elements i equiped until 3 hrs after i equiped them. That also means i can use a max of 3 elements at once. in my right eye. With my Sharignan, I can foresee my oponent's next move/attack and prepare to dodge, block, or even counter-attack. I can also copy their justu. 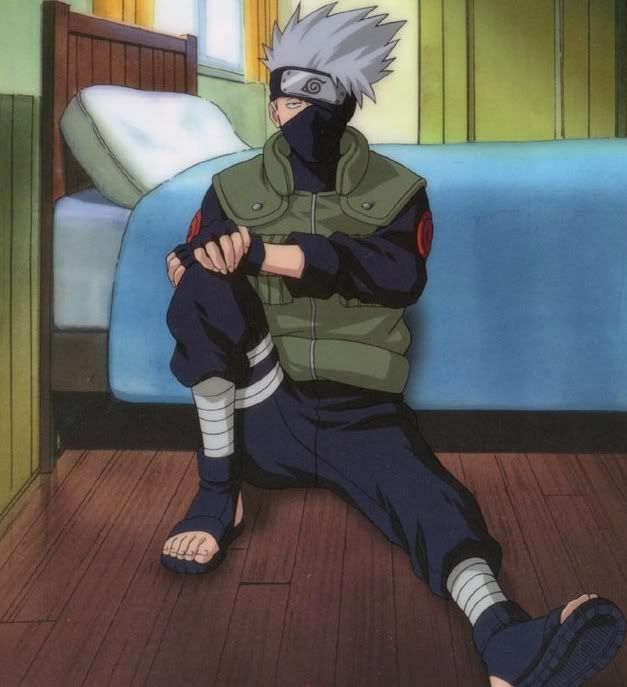 After i release my Sharingan, my Zanpatou disappears. But in its place, a ball of intense lightning chakra forms in my left hand while short lightning bolts around it flicker constantly. Roar, Yori Kuragari Tame Kuragari, Chidori! 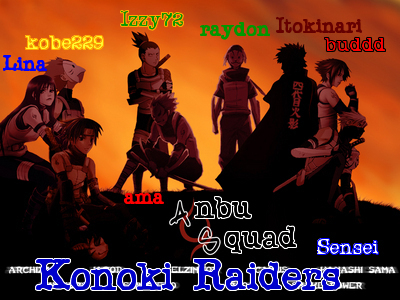 ANBU Squad: Planning on becoming squad captain of Konoki Raiders . Fire- The element of offense. Uses relentless attacks to weaken the oponent before going in for the final blow. Water- The element of defense. Uses the oponents attacks while in defense mode as a weapon when switching to offensive mode. Wind - The element of concentration. Uses raw, uncontrolled power but uses the mind to make something more powerful and useful. Lightning- The element of speed. Uses the ability to analyze the oponent for weak spots and strikes those spots with a good combination of speed and power. Darkness: A combination of anything except lightning. Found at the hearth. The chakra of love and is blocked by hatred. Found at the throat. The chakra of truth and is blocked by lies. Found at the center for the forehead. The chakra of and is blocked by seperation. Found at the. The chakra of cosmic energy and is blocked by earthly desires. Effects: The surface of the moon becomes like metal and therefore, water jutsu cannot be used (except 1) due to the difficulty of controlling them. During this time, earth jutsu are amazingly strong. No fire jutsu (except 1) can be used during this time and dark jutsu are amazingly strong.